Four Arabs charged with attacking an IDF major north of Be'er Sheva a month ago. An IDF officer who was viciously attacked by Bedouins a month ago described the ordeal to police interrogators. His testimony, which was published by Channel 2 News Thursday, describes the harrowing ordeal in detail. The 28-year-old officer, identified only by his first initial, Y., had given a lecture to soldiers in Platoon Commander Course at a Paratrooper base north of Be'er Sheva. At 9:00 p.m. he got in his car and started driving toward Devira Junction. "As I was driving I noticed a minibus on the side of the road and several people running toward the road. I honked at them so that I would not run them over," he said. 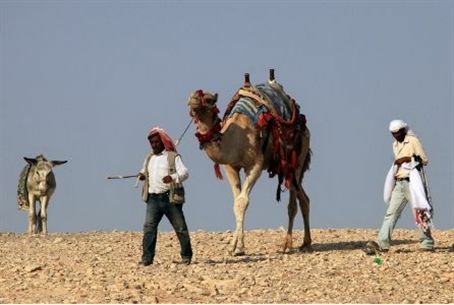 It seems that his pressing the car's horn is what got the Bedouins agitated. The officer kept driving until four vehicles arrived and started to block him. "I understood that I was in trouble and increased speed. They tried to push me off the road. I feared for my life, so I immediately called the 100 hotline and I managed to report the incident." "One of the vehicles blocked me from the front and the second one flanked me," he said. "I drove backward but one of them hit me and I stopped. Six people came out of the vehicles. They opened the car's door. One of them smashed the windows. I feared for my life. They took me out, threw me on the road and started hitting my entire body, with no reason. They punched me, kicked me, hit me with rocks they held in their hands… I shouted at them in Arabic that police were on the way so that they would run away and leave me. This all lasted about three minutes." Police arrived on the scene and found Captain Y drenched in blood. He was taken to Soroka Hospital, and released a day later. Six suspects from the Altalalka tribe were arrested. They denied the charges but DNA evidence from the scene as well as statements made to a police informer in the jail cell tied four of them to the crime. The four – Ahed Altalalka, 19, Rafa Altalalka, 22, Sliman Altalalka, 33, and Talaat Altalalka, 23 – were charged with seriously endangering human life on a road, aggravated assault and deliberate damage. They told police they attacked the soldier because he had seen them delivering illegal aliens and did not want him to tell police what he saw. Two other suspects were released because there was insufficient evidence tying them to the crime.